Within the next two decades, it is predicted that every person, industry, and service provider will be using 5G systems. The fifth generation wireless standard is expected to underpin new technology deployments as well as future technologies that at this time can only be imagined. 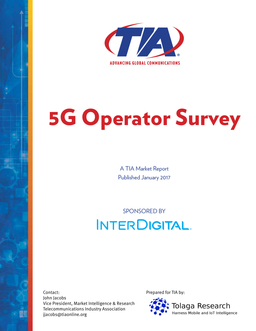 This paper, an update on TIA's previous 2015 5G Operator Survey, provides valuable insight into the network operators' view of the 5G revolution and presents important findings about usage in the near future.